UPHAM, N.M. ? A new private spaceship designed to carrytourists to space touched down for the first time Friday (Oct. 22) on therunway of Spaceport America, soon to become its home base. SpaceportAmerica is touted as the world's first purpose-built commercialspaceport, and will serve as the headquarters for Virgin Galactic's suborbitalspacecraft once the spaceport is complete. A giant hangar and other facilitiesare still under construction. "I can't wait for our first day of commercialoperations here," said Virgin Galactic founder and British billionaire SirRichard Branson. "Today is very personal as our dream becomes more real." While SpaceShipTwo is designed to make shortjoyridesto suborbital space, Virgin Galactic has set its sights on orbital travel,too. "Obviously, we want to move on to orbital after we'vegot suborbital under our belts, and maybe even before that," Branson said. The company will aim to win a NASA contract to transportastronauts to the International Space Station, he said. The space agency plansto look to private space companies to take over this task once the spaceshuttle fleet retires next year. "We plan to start work on an orbital program quitequickly," Branson said. This new partnership between NASA and commercial spaceflightcompanies was authorized by a NASA authorization bill just signed into law byPresident Obama earlier this month. NASA's deputy administrator Lori Garver was on hand at thespaceport dedication to affirm the agency's support for the burgeoning privatespace industry. "I can assure you, we wish you nothing but clear skiesand success ahead. Godspeed," Garver said. Branson and his family are set to be the first passengersaboard SpaceShipTwo when it begins official operations in nine to 18 months, hesaid. "It's like Christmas, you want to go, you can'twait," said future Virgin Galactic passenger Sonja Rohde, who was onsiteto celebrate the spaceport's dedication. "I'm not scared, justexcited," she said of her trip. Rohde is among a group of "founders" who havealready paid the $200,000 ticket price in full. "It was always a childhood dream to go to space,"Rohde told SPACE.com. "Now I'm the first German woman to come tospace." Another founder, Perveen Crawford of Hong Kong, said thecost of a Virgin Galactic trip was definitely worth it. "It's a bargain compared to the Russians," shesaid, referencing the roughly $35 million past space tourists have paid toRussia's federal space agency to ride aboard the Soyuz to the InternationalSpace Station. By comparison, the SpaceShipTwo flights will only be inspace for about five minutes, providing a brief experience of weightlessnessand the view of Earth from above before heading back down to the ground. Virgin Galactic has been making steady progress in readyingits spaceship for flight. SpaceShipTwo made its firstever solo test flight Oct. 10, when it was dropped by WhiteKnightTwoin midair and glided down to the ground. The craft is set to make its first solo powered flight, whenit will fire its rocket engines, in the next few months. "Today we are closer to the dream that we all sharethan we have ever been," said Virgin Galactic CEO George Whitesides. To mark the dedication of Spaceport America, officialsannounced the main runway will be named "The Governor Bill RichardsonSpaceway" after the current governor of New Mexico. "What a great day for the state of New Mexico and forspace," Richardson said. Branson and other private space pioneers creditedthe governor with helping to make the spaceport possible. "I hope that New Mexico is branded as a place wheresomeone with a good idea can make it happen," Richardson said. 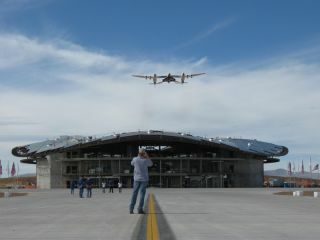 Branson said New Mexico was the perfect place forSpaceShipTwo's home base. "The wide expanse of open country, the clear space, theexcellent weather ? where else would you build Spaceport America?" Bransonsaid.